Sugar House • 'S-Line' opens amid pomp and fireworks; free rides offered on Saturday. Francisco Kjolseth | The Salt Lake Tribune The new Streetcar arrives in Sugar House to much fanfare and fireworks for the grand opening ceremonies on Thursday, Dec. 5, 2013. The new S Line opens to the public on Saturday. 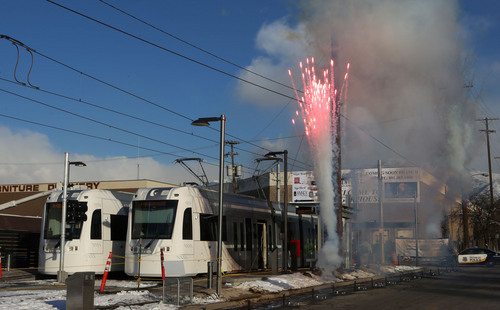 Francisco Kjolseth | The Salt Lake Tribune The new Streetcar is celebrated in Sugar House with much fanfare and fireworks following grand opening ceremonies on Thursday, Dec. 5, 2013. The new S Line opens to the public on Saturday. 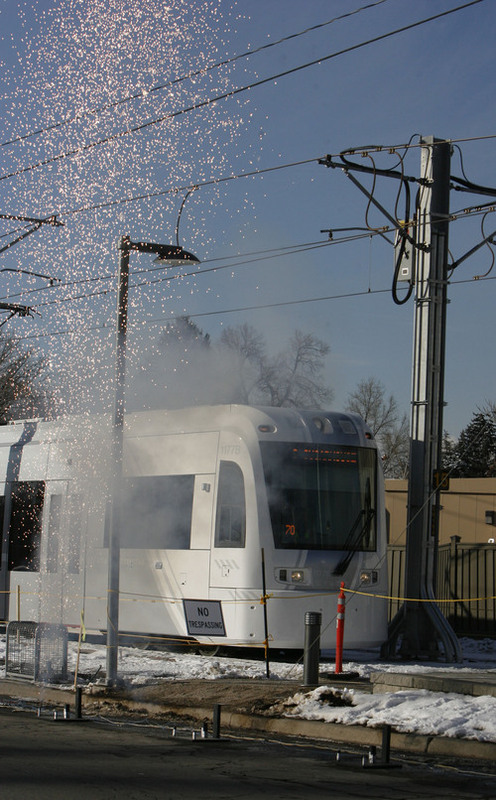 Fireworks burst to greet a new Sugar House Streetcar as it arrived Thursday packed with officials for the line&apos;s opening ceremonies. Leaders then hailed the project for also making local development boom. "It just completely rejuvenates and revitalizes and charges forward our communities," Salt Lake City Mayor Ralph Becker told the crowd at Fairmont Park at the line&apos;s eastern end. He said it already has attracted $400 million of investment and development in Sugar House. South Salt Lake Mayor Cherie Wood said it has attracted 1 million square feet of new retail development, 350,000 square feet of office space and 3,000 new residential units in her city. Federal Transit Administrator Peter Rogoff said that shows why the project won a $26 million grant in the highly competitive Transportation Investment Generating Economic Recovery (TIGER) II program: because officials figured it would help make "for a better future, more jobs, more prosperity and an even greater quality of life" by improving transportation options. U.S. Transportation Secretary Anthony Foxx sent a written statement saying, "TIGER-funded projects like the Sugar House Streetcar make a strong case for investing in our nation&apos;s transportation infrastructure." Rogoff also praised its Utah partners in the project. "The Obama administration loves to partner with this region because this region has vision, and the S-Line [the streetcar&apos;s new official name] is just one part of it." It is the fourth major rail line that the Utah Transit Authority has completed in a year. The FrontRunner extension from Salt Lake City to Provo was finished last December; the airport TRAX opened in April; and the Draper TRAX followed in August. UTA General Manager Michael Allegra noted the streetcar ceremonies occurred 14 years to the day after the area&apos;s first TRAX line opened  leading to what has become 130 miles of UTA rail. The new streetcar runs two miles eastward from the TRAX line&apos;s Central Pointe Station on 2100 South with seven stops, spread about every two blocks, to Fairmont Park in Sugar House. UTA officials said the rail portion of the project cost about $37 million, but extra amenities including trails and green space along the corridor raised the total price tag to $55 million. The streetcar  which uses the same type of train car used on newer TRAX lines  averages a leisurely 15 miles per hour and hits a maximum of only 25 mph. The two-mile trip takes about 13 minutes. Salt Lake City Council member Soren Simonsen noted the last streetcars disappeared from Salt Lake City 50 years ago and now return to the Sugar House area that was built around those old streetcars 100 years ago. Becker spoke of cross-cultivating modes of transport. "This streetcar is unique among streetcar lines in that it is in a dedicated right-of-way [in a historical railway corridor] and it is truly multi­modal with streetcars, a full pedestrian and bicycle path that will help tie trails from Parleys Canyon to the Jordan River." The city is considering extending the line in phases, perhaps eventually as far as the University of Utah. Public preview • On Saturday, free rides on the line are offered to people who donate a can of food for the needy from 10 a.m. to 6 p.m. Regular service • Begins Sunday. Promotional $1 fares are available to those who pay by electronic fare media such as UTA&apos;s Farepay cards. Otherwise, the regular cash fare is $2.50  but transfers into the TRAX system are free with that fare.